From January through May 2005 one of the most profiled reporters of the Norwegian National Broadcasting corporation NRK, Hans Wilhelm Steinfeld, made a series of claims regarding "Polish Nazis" on NRK's website and in the flagships of the Norwegian printed press, the dailies Aftenposten and Verdens Gang (VG). He claimed the existence of Polish Nazis in the present Ukrainian city of Lviv (Polish: Lwow, Russian: Lvov, German: Lemberg), on the basis of events that took place in the area before and during World War II. Mr. Steinfeld's claims are untrue, unsubstantiated, and offensive to Poles - Jews and non-Jews alike. It was the responsibility of the Norwegian press and academic communities to rebut Mr. Steinfeld's clear falsifications, even more so as he is one of Norway's most influential and celebrated journalists and has had an illustrious career covering Central and Eastern Europe. Sadly, neither the press, with the exception of editor Nils Morten Udgaard, nor professional historians in Norway have adequately taken him to task, either because of ignorance of the issues or because of a fear of accusing a star of Norwegian journalism of shoddy work. We have therefore collected testimonies from the world's leading experts on the issue, both those Mr. Steinfeld claims as his sources and those he didn't bother to consult. The experts include both professional historians and eye witnesses from the relevant period, such as dr. Raul Hilberg of the American Academy of Arts and Sciences, professor Israel Gutman of the Yad Vashem Memorial in Jerusalem, professor Anatoly Podolsky of the Ukrainian Holocaust Centre in Kyiv and professor Norman Davies of the British Academy, the world's leading authorities on the Holocaust, Jewish and Polish history. This article collects their and other experts’ rebuttals of Hans Wilhelm Steinfeld's claims. The Norwegian public deserves to be adequately informed and realise that Mr. Steinfeld’s version of history is both untrue, offensive, and reflects badly on his general credibility. "I have seen a copy of Mr.Steinfeld's comments, and they strike me as completely unacceptable. They are characterised by the terminology of the Stalinist era, and by all the signs of prejudiced sources. In my view, it is not in order to comment on the history of Poland without being aware of the basic facts or of a wider range of opinion. In order to justify his statements, Mr. Steinfeld has repeatedly been referring to several sources including researcher Tor Bukkvoll at the Norwegian Defense Research Establishment (FFI), a 1994 TV report from Lviv by NRK journalist Jan Espen Kruse, and the Ukrainian Holocaust Centre. Below we list the specific claims made by Mr. Steinfeld and document that he misquotes the sources to which he appeals. The NRK footage made by Jan Espen Kruse in 1994 shows Ukrainian activists of UNA-UNSO, no Poles whatsoever. UNA-UNSO is a Ukrainian ultra-nationalist movement that is not only anti-Semitic but also anti-Polish. That in itself makes it unlikely that ethnic Poles would be represented in the ranks of this organisation, which undermines Mr. Steinfeld’s use of this report to support his view. Norway's prime expert on Polish language and literature, Mr. Ole Michael Selberg, carefully studied this TV report to look for any indication of Polish participation. He found no such indication whatsoever, as he reports in a comment on Mr. Steinfeld’s use of sources (Aftenposten January 30th 2005). Maxveritas.com contacted NRK Archives for permission to publicise pictures from the TV report. NRK refused to grant such permission. We can only conclude that Mr. Steinfeld misquoted Mr. Bukkvoll. An interview with Mr. Steinfeld in VG dated January 26th 2005 reports him as saying his claim is “proved” by “information from the Ukrainian Holocaust Centre”. The rest of the page lists perpetrators from many nations, but not Poles. "I think the Swabians [Germans] will beat the Muscovites [Russians], and if the Germans come here we have a chance of being set free. And you, Mr. Begin, don't you worry. We shall stand by you and help you". This is in no way an expression of sympathy with the Nazis, merely a hope to get out of prison. Menachem Begin later joined the Polish II Corps formed on the territory of the USSR. The Polish Home Army and other Polish underground units were the only ones that aided the Jewish fighters in obtaining firearms and explosives in addition to support combat action. 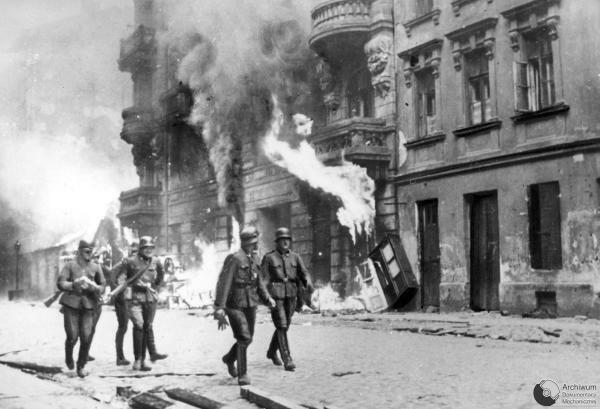 In a telephone conversation with maxveritas.com in February 2005, this was confirmed by dr. Marek Edelman, former commander of the Jewish Ghetto Uprising in Warsaw 1943. He read Mr. Steinfeld's article which he labelled "utter nonsense", and recommended that Mr. Steinfeld read his book (“The Ghetto Fights”). “Mr. Steinfeld's information regarding the Jewish Ghetto Uprising in Warsaw is also incorrect. The instigator of the uprising, the ZOB (Jewish Fighting Organisation), was later formally accredited as a conspirator-fighting unit by the Polish Armia Krajowa (Polish Home Army) once their struggle began. Armia Krajowa supplied the Jewish rebels with firearms, primarily pistols and explosives, albeit the general perception among the fighters was that they had not received enough and far from the amounts that they deemed necessary. I should know, I was there”. As regards "Mila 18" by Leon Uris, we simply note our surprise that Mr. Steinfeld uses a work of fiction as his historical source. Witness also professor Israel Gutman: "In any case, to claim that Marshal Pilsudski based his policies on anti-Semitism is a straight lie". On page 40 in Simon Wiesenthal's book "Recollections" we read of "someone" denouncing a Jewish family to the Germans. The Jewish family “had been in hiding with a Polish family”. This is the only mention of Poles on the cited page: As saviours. On referred pages in Leo Eitinger's book Poles are not mentioned. The tsarist-regime and the openly anti-Semitic attitude of the Orthodox church is. Poles are predominantly Catholics. “At that occasion Simon Wiesenthal said he agreed with my description: The further east the Germans came, the “lower” the fences around the concentration camps became. And when the Germans came to Kiev, they just drove the Kiev Jews out to the ravines by Babij Yar…” (italics added). According to Mr. Steinfeld himself, this was his characterisation, not Mr. Wiesenthal’s. "Babij Yar in the Ukraine was not a concentration camp. It was a place of annihilation, where German murdered mostly Jews. This part of Ukraine was not part of the Polish republic in the inter-war years". We would also like to mention that the memorial at the site of Babij Jar is a quintessentially Jewish symbol: The Menorah, the seven-branched candelabra. As we have shown, Mr Steinfeld time and again fails to justify his outrageous allegations of Polish Nazism. He distorts the historical truth, invents events that never happened, and betrays his sources and consequently compromises his own profession. Mr. Steinfeld’s disinformation and manipulations have caused vehement reactions from some of the world’s leading historians of the Holocaust, Jewish, and Polish history, as well as survivors who witnessed the horrors of Hitlerism and Stalinism. We have quoted some of them in this essay, and have made their full testimonies available through the links in the left-hand menu. We recommend that everyone read their statements closely, because the truth is important, in particular to nations that were devastated by Nazi crimes.The seriousness displayed by our commentators is commensurate with the gravity of falsifying the history of Europe’s suffering. Sadly, this seriousness can be found neither in Mr. Steinfeld, nor in his employer NRK and its director, nor in the ethical watchdog of the press, the Press Ethics Board (Pressens Faglige Utvalg, PFU). Mr. Steinfeld has been confronted with several of the above refutations, but refuses to acknowledge his mistakes. To VG on January 26th 2005 he replied: “It is pathetic that so much noise is caused by one little sentence”. NRK and its director, John G. Bernander, by not denouncing Mr. Steinfeld’s behaviour, betrays NRK’s stated mission, which he himself has expressed: “Credibility and diversity are the core of NRK’s work” (Italics added). The Press Ethics Board, having easy access to Mr. Steinfeld’s sources, “finds that Hans-Wilhelm Steinfeld’s article [on nrk.no January 12th 2005]… must be acceptable as a subjective contribution to a long since heated debate”. We can only reply by asking the fundamental question of both Norwegian academic historians and of the leaders of the Norwegian Press: If outright falsification does not disqualify Mr. Steinfeld as a journalist and historian, what does? We wish to express our deepest gratitude to those that chose to spend their time and effort by contributing with information and statements to this website. Some of the comments published here were initially sent to Aftenposten as contributions in course of the debate, but were never printed. Maxveritas.com also expresses its gratitude to freelance journalist Ms. Natasza P. Sandbu (former reporter and editor at Aftenposten), who served as research consultant for this essay, and to dr. Martin E. Sandbu of Columbia University, New York, for invaluable editorial assistance. Thanks also to Mr. Nils Skreiberg, for publishing an informative article titled "Poland's struggle against Nazism" (in Norwegian, Polish version here) in VG 11.02.2005. Our further thanks go to Mr. Piotr Lada in Australia and Mr. Henryk Malinowski in Norway for their assistance and help. Finally, we express our gratitute to the many individuals around the world for their encouragement and support.